Roorkee/Lucknow, Feb. 10 (PTI): Two people were arrested on Sunday in connection with the hooch tragedy that claimed over 70 lives in two adjoining districts in Uttarakhand and Uttar Pradesh, police said. The death toll in Uttarakhand rose to 36 on Sunday, with 11 more people succumbing after consuming the spurious liquor in a village in Haridwar district. 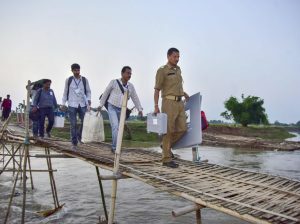 According to an Uttar Pradesh government statement released Saturday evening in Lucknow, 36 died in Saharanpur district which adjoins Uttarakhand. According to the police, the arrested father-son duo, Fakira and Sonu, told investigators that they had procured the spurious liquor from Uttar Pradesh and sold it in Balupur and its neighbouring villages in Uttarakhand’s Haridwar district. The two are residents of Balupur village, Haridwar SSP Janmejay Khanduri and Saharanpur SSP Dinesh Kumar, who held a joint press conference in Roorkee, told PTI. The victims, hailing from Haridwar district in Uttarakhand and Saharanpur district in Uttar Pradesh, had consumed the liquor after the ‘tehravin’, the 13th day of mourning ritual, following a relative’s death. The tragedy took a political hue on Sunday, with UP Chief Minister Yogi Adityanath suggesting the involvement of the Samajwadi Party in “such mischievous acts” and BSP chief Mayawati seeking a CBI probe into the matter.